- T'challa continues to express various concerns. Carol addresses them by showing all she is doing to make sure the visions are correct and the proper steps are taken. There is a control room which monitors Ulysses (T'challa expresses concern of his status quo as well) and another room with various experts (lawyers, diplomats, physicists) to make sure things are done the right way. - Carol then goes and talks to Barton. Or yell at Barton. - T'challa goes with Carol and Kamala to stop a possible threat from Thundersword. - They get to his house and find the award that was building energy. They arrest him for violating his parol but then his wife is mad because there is no one to watch the kids and such. - Carol talks to Gilrich. They discuss stuff, including ol' dude going back to prison and the problems that it will cause for his family. She says he doesn't deserve prison as he didn't set off the award and it was activated remotely but Peter doesn't care. - T'challa shows up. They will talk to the Ultimates to try and find the Beyonder and maybe get answers from him. He also says Wakanda payed ol' dudes bail so he could go back home until his hearing. - T'challa and Carol seem to end on the same note and at an understanding. - Carol's approval rating is increasing. 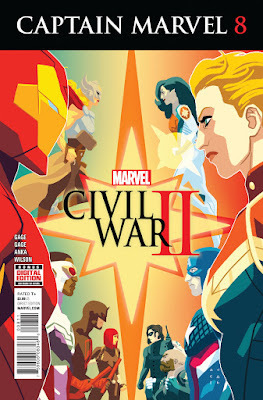 - I was really hoping that this issue, combined with the Ultimates, would be the beginning of T'challa leaving Carol's side and joining Starks. However, the doesn't appear to be the case at all. 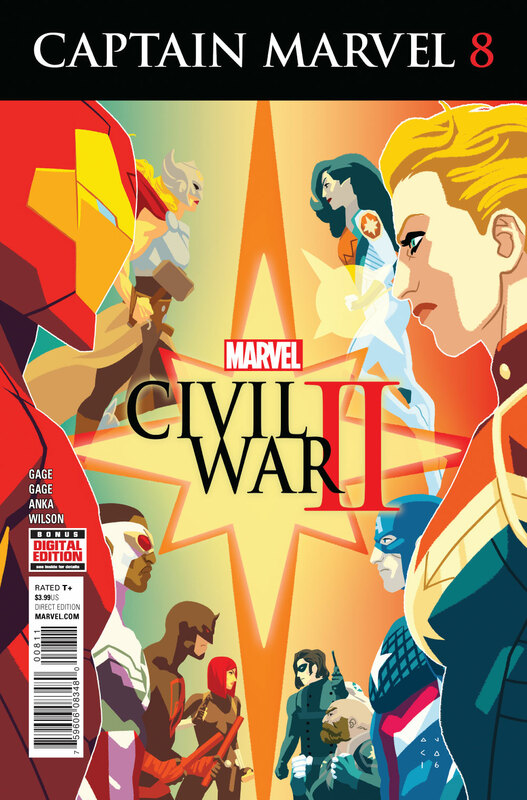 But I guess tie ins have to sync together with the main book where T'challa was firmly on Carol's side at the super hero show down. - At least it was a rational discussion between the two. Sounded like two, high functioning adults bringing valid points to the argument without getting hot headed. Carol's side of things looked much better here... but it is her book so of course it is. Her side looked terrible in All New All Different Wolverine for instance.